Compartment syndrome of the lower leg is a condition where the pressure increases within a non-extensible space within the limb. This compromises the circulation and function of the tissues within that space as it compresses neural tissue, blood vessels and muscle. It is most commonly seen after injuries to the leg and forearm, but also occurs in the arm, thigh, foot, buttock, hand and abdomen. This condition may result in tissue death (necrosis) due to compression of blood vessels and subsequent disruption in circulation and a lack of oxygen (ischemia) if it is not diagnosed and treated appropriately. There are 3 types of compartment syndrome; acute (ACS), subacute, and chronic exertional compartment syndrome (CECS). In the lower leg there are 4 compartments, the anterior (A), lateral (L), deep posterior (DP) and superficial posterior (SP). The bones of the lower leg (tibia and fibula), the interosseous membrane and the anterior intermuscular septum are the borders of the compartments. The anterior compartment includes; tibialis anterior, extensor hallucis longus, extensor digitorum longus, peroneus tertius, tibialis anterior and the deep peroneal nerve. The average annual incidence of ACS for men is 7.3 per 100.000 and for women 0.7 per 100.000. Many of the patients are young men with fractures of the tibial diaphysis, with a injury to soft tissues or those with a bleeding diathesis. Any condition that results in an increase of pressure in a compartment can lead to the development of acute (ACS) or chronic exertional compartment syndrome (CECS). One of the main causes of CECS is repetitive and strenuous exercise. During strenuous exercise, there can be up to a 20% increase in muscle volume and weight due to increased blood flow and oedema, so pressure increases. Oedema of the soft tissue within the compartment further raises the intra-compartment pressure, which compromises venous and lymphatic drainage of the injured area. If the pressure further increases, it will eventually become a cycle that can lead to tissue ischemia. The normal mean interstitial tissue pressure in relaxed muscles is ± 10-12 mmHg. If this pressure elevates to 30 mmHg or more, small vessels in the tissue become compressed, which leads to reduced nutrient blood flow, ischemia and pain. [ The anterior compartment is affected more frequently than the lateral, deep and superficial posterior compartments. Pain and swelling are the leading symptoms in this condition and it appears and aggravates during physical activities such as running and other sports like basketball and football. The pain is usually located over the involved compartments and may radiate to the ankle or foot. Burning, cramping, or aching pain and tightness develop while exercising. In extreme cases (or with inappropriate treatment) it is possible that the lower leg, ankle and foot can be paralysed. Pain is classically the first sign of the development of ACS, is ischaemic in nature and is described as being out of proportion to the clinical situation. The sensitivity of pain in the diagnosis of ACS is only 19 % with a specificity of 97 %,  which can result in a high proportion of false-negative or missed cases, but a low proportion of false-positive cases and if present the condition is recognised relatively early. Pain is often felt with passive stretching of the affected muscle group. For example, if ACS is suspected in the deep posterior compartment of the leg and the foot is dorsiflexed, increased pain will be evident. Paraesthesia and hypoesthesia may occur in the territory of the nerves traversing the affected compartment and are usually the first signs of nerve ischaemia, although sensory abnormality may be the result of concomitant nerve injury. Ulmer reported a sensitivity of 13 % and specificity of 98 % for the clinical finding of paraesthesia in ACS, a false-negative rate that precludes this symptom from being a useful diagnostic tool. Paralysis of muscles contained in the affected compartments is recognised as being a late sign and has equally low sensitivity as others in predicting the presence of ACS, probably because of the difficulty in interpreting the underlying cause of the weakness, which could be inhibition by pain, direct injury to muscle, or associated nerve injury. A precise diagnosis of chronic exertional compartment syndrome can be made with a thourough history, a physical examination, compartment pressure testing and/or bone scanning. Patient history and physical examination play an important role in diagnosing ACS. In some cases however, history and physical examination are insufficient to determine a correct diagnosis. In these cases and in other situations where it is impossible to elicit a reliable history or to do a physical examination (lack of consciousness/coma, intoxication, small children, etc. ), intra-compartmental pressure can offer a solution. The normal pressure in a muscle compartment is between 10-12 mm Hg. By recognising these signs, it is possible to identify ACS and CECS early, so that appropriate treatment can be started immediately. The most important determinant of a poor outcome from acute compartment syndrome after injury is delay in diagnosis. The complications are usually disabling and include infection, contracture and amputation. One of the main causes of delay may be insufficient awareness of the condition. While it is acknowledged that children, because of difficulty in assessment, and hypotensive patients are at risk, most adults who develop acute compartment syndrome are not hypotensive. Awareness of the risk of the syndrome may reduce delay in diagnosis. Continuous monitoring of compartment pressure may allow the diagnosis to be made earlier and complications to be minimised. Early diagnosis and treatment are important in order to avoid long-term disability after acute compartment syndrome. Palpation of the lower leg - here will be a firm, wooden feeling in the area. The gold standard treatment is fasciotomy, but most of the reports on its effectiveness are in short follow-up periods. It is recommended that all four compartments (anterior, lateral, deep posterior and superficial posterior) should be decompressed by one lateral incision or anterolateral and posteromedial incisions. Surgery Patients may be able to participate in all common activities a few days post surgery. Treatment should begin with rest, ice, activity modification and if appropriate, nonsteroidal anti-inflammatory drugs. The only nonoperative treatment that is certain to alleviate the pain of CECS is the cessation of causative activities. Normal physical activities should be modified, pain allowing. Cycling may be substituted for running in patients who wish to maintain their cardiorespiratory fitness, as it is associated with a lower risk of compartment pressure elevation. Massage therapy may provide some benefit to patients with mild symptoms or to those who decline surgical intervention. Overall, however, nonoperative treatment has been generally unsuccessful (LoE: 2a)  and symptoms will not disappear without treatment. As alluded to, untreated compartment syndrome can cause ischemia of the muscles and nerves and can eventually lead to irreversible damage like tissue death, muscle necrosis and permanent neurological deficit within the compartment. Post-surgical therapy for CECS includes assisted weight bearing with some variation, depending on surgical technique. Early mobilisation is recommended as soon as possible to minimise scarring, which can lead to adhesions and a recurrence of the syndrome. Acute compartment syndrome (ACS) occurs when increased pressure within a compartment bounded by unyielding fascial membranes compromises the circulation and function of the tissues within that space. ACS is a surgical emergency. ACS most often develops soon after significant trauma, particularly involving long bone fractures of the lower leg or forearm. ACS may also occur following penetrating or minor trauma, or from nontraumatic causes, such as ischemia-reperfusion injury, coagulopathy, certain animal envenomations and bites, extravasation of IV fluids, injection of recreational drugs, and prolonged limb compression. In patients with clinical symptoms of CECS and confirmation of elevated exertional compartment pressures, operative treatment demonstrated improved clinical outcomes compared with conservative treatment. Patient's under 23 years and isolated anterior compartment release (compared with anterior/lateral release) are factors associated with improved subjective function and satisfaction after fasciotomy. Avoidance of lateral release is recommended unless clearly warranted. An increased need for analgesics is often the first sign of CS in children and should be considered a significant sign for ongoing tissue necrosis. CS remains a clinical diagnosis and compartment pressure should be measured only as a confirmatory test in non-communicative patients or when the diagnosis is unclear. Children with supracondylar humeral fractures, forearm fractures, tibial fractures, and medical risk factors for coagulopathy are at increased risk and should be monitored closely. When the condition is treated early with fasciotomy, good long-term clinical results can be expected. ↑ 6.0 6.1 Turnipseed, William D., Christof Hurschler, and Ray Vanderby. 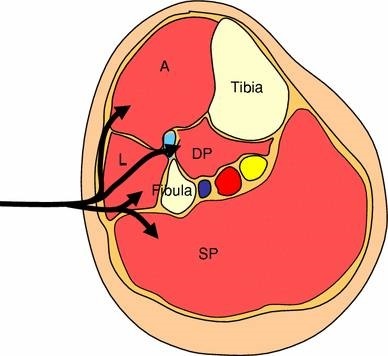 "The effects of elevated compartment pressure on tibial arteriovenous flow and relationship of mechanical and biochemical characteristics of fascia to genesis of chronic anterior compartment syndrome." Journal of vascular surgery 21.5 (1995): 810-817. ↑ 7.0 7.1 Styf, Jorma R., and Lars M. Körner. "Diagnosis of chronic anterior compartment syndrome in the lower leg." Acta orthopaedica Scandinavica 58.2 (1987): 139-144. ↑ 9.0 9.1 Van der Wal, W. A., et al. "The natural course of chronic exertional compartment syndrome of the lower leg." Knee Surgery, Sports Traumatology, Arthroscopy 23.7 (2015): 2136-2141. ↑ 12.0 12.1 McQueen, M. M., and P. Gaston. "Acute compartment syndrome." Bone & Joint Journal 82.2 (2000): 200-203. ↑ Hutchinson MR, Ireland ML. “Common compartment syndromes in athletes. Treatment and rehabilitation” Sports Med. 1994 Mar;17(3):200-8. ↑ Slimmon, Drew, et al. "Long-term outcome of fasciotomy with partial fasciectomy for chronic exertional compartment syndrome of the lower leg." The American Journal of Sports Medicine 30.4 (2002): 581-588. ↑ Pedowitz RA, Hargens AR, Mubarak SJ, Gershuni DH: Modified criteria for the objective diagnosis of chronic compartment syndrome of the leg. Am J Sports Med 1990;18:35-40. ↑ Orlin, Jan Roar, et al. "Prevalence of chronic compartment syndrome of the legs: Implications for clinical diagnostic criteria and therapy." Scandinavian Journal of Pain 12 (2016): 7-12.